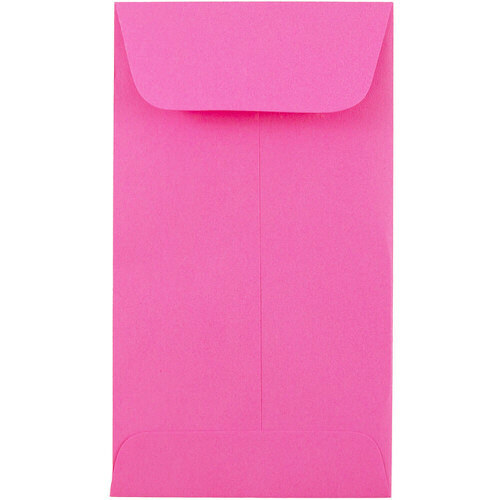 Whether you want to go vibrant or whether you want to go pale, our collection of pink #5 1/2 Coin Envelopes will match any kind of mood. Our Ultra Fuchsia shade is perfect for those not afraid to say (or scream) ‘hey! I love pink!’. Our baby Pink shade is perfect for those who exemplify their sweetness and charm. Either way, these will store all of your small belongings to perfection. Whether you want to store something valuable like jewelry or something as simple as coins, these envelopes will be the perfect desk accessory. The quality paper along with the gum closure will ensure the safety of all of your items, whatever you decide to put inside. Pink #5 1/2 Coin Envelopes measure in at 3 1/8 x 5 1/2 inches. Available in Ultra Fuchsia and Baby Pink. Each envelope is 30% recycled too! Perfect for those trying to help the environment in any way they can.